We quickly prototype human machine interface devices and iterate on concepts. The 3D Printers we operate are able to generate human machine interface components of various size and rezolution. CAD models are drawn with a variety of tools including Autodesk, Creo, Alibre and Blender, and models are exported to the appropriate printer. We also designs circuit boards, assembles electronic circuits and packages electronic assemblies as required to test new human machine interface concepts or to provide full sets of devices to be used in evaluation campaigns or training tools. Additionally, we integrate various hardware components together to build fully-functional cockpit mockups. Although our principal experience is with Orion-specific hardware, our skillset can be easily applied to any human machine interface prototyping. Our engineers can quickly design and manufacture functional hardware solutions tailored to your specific situation. Aerospace Applications North America designs and manufactures functional prototypes of the Orion spacecraft display units, for use at various facilities at NASA’s Johnson Space Center and at NASA contractor locations. The prototype display units include selection keys and control knobs located on the display bezel. They operate in a similar way to the actual Orion flight displays, at a fraction of the cost. The prototype display units are used to evaluate Orion displays and controls in a realistic format, and to familliarize astronauts with the operation of the spacecraft’s user interface. The prototype display units are also employed by research teams at NASA to test new technologies in an Orion-like environment. Our team designs and 3D prints display bezels and bezel buttons, designs and assembles bezel button circuits, mounts display unit screen to bezel and packages screen and bezel button electronics. 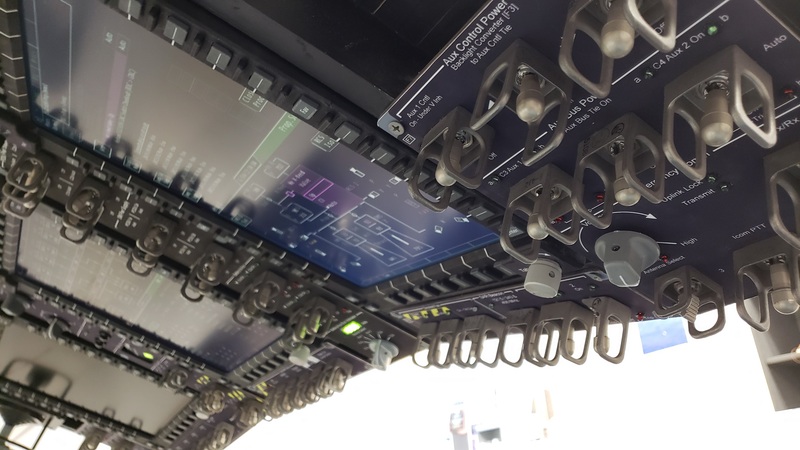 Aerospace Applications North America designs and manufactures fully-functional prototypes of the Cursor Control Device (CCD) that is used by operators to interact with the Orion display formats during dynamic phases of flight. During these phases, which include ascent and reentry, operators are unable to reach the display units’ bezel keys and have to rely on a CCD located on the left armrest of their seat. This device includes several buttons, operated with the fingers of the left hand, which are used to select a display unit, to navigate to a specific format on the selected unit, and to interact with the display objects of the specific format. Other buttons on the CCD are employed to provide single-click access to critical cockpit functions. The prototype CCDs include a USB interface and can be conveniently connected to desktop and laptop computers. They operate in a similar way to the flight version of the Orion CCD, at a fraction of the cost. 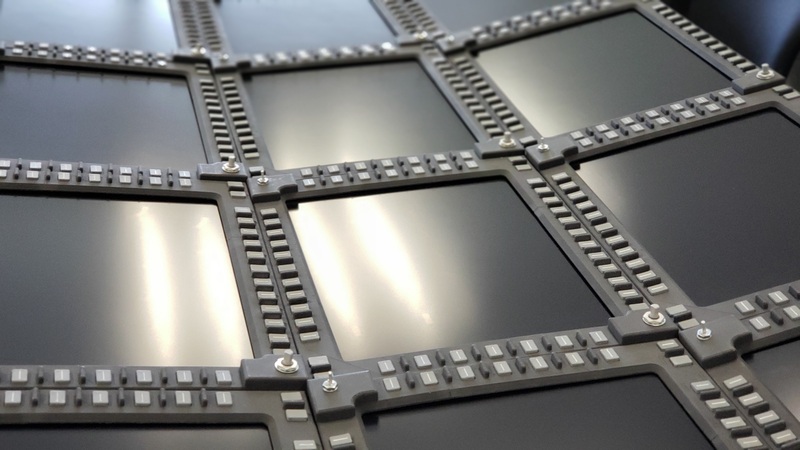 Our team manufactures a large quantity these prototype CCDs, for use by astronauts, engineers and researchers around the Johnson Space Center and at NASA contractor facilities to operate protoype Orion displays or future human machine interfaces derived from Orion. 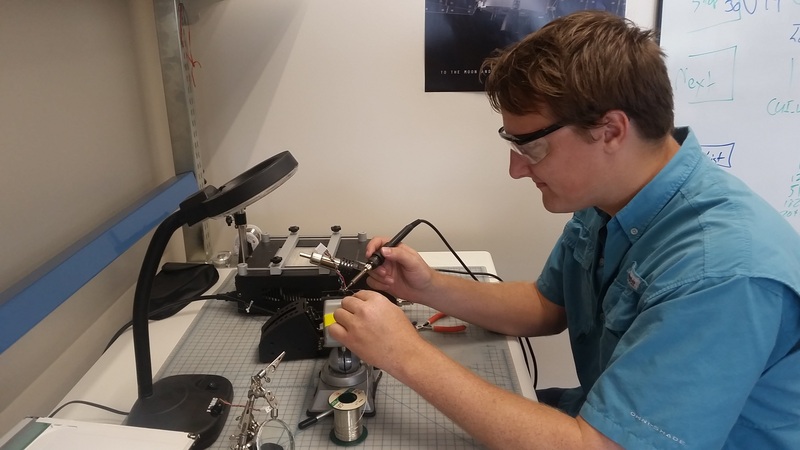 Our team designs and 3D prints the prototype CCD shells, designs and assembles button electronics, mounts the various components inside the shells, and packages the resulting devices in an easy-to-carry format. Aerospace Applications North America assembles functional prototypes of the seven Orion switch panels, for use in the Orion cockpit mockups at the Johnson Space Center. Although the Orion spacecraft user interface consists mostly of software display formats presented to the operators via computer screens, some critical controls are still accessible through hardware switch panels. These panels can be modeled in software, but to get a realistic feel of the actual operation and ergonomics of the panels, a physical mockup is required. The prototype switch panels include multi-position switches, spring-loaded switches, rotary knobs and a digital readout. These are mounted to their correct locations on the various panels per the Orion specification. The position of these knobs is periodically read by the integrated electronics and transmitted to the simulation computer through a single USB cable. The prototype swith panels are mounted inside the Orion cockpit mockups at NASA’s Cockpit Rapid Prototyping Laboratory (RPL) and in the Building 9 Orion mockup, both located at the NASA Johnson Space Center. Astronauts and engineers use the panels to evaluate the Orion user interface to familliarize themselves with the operation of the Orion cockpit. Our team prints and affixes panel graphics, wires switches and mounts them to the panels, designs and assembles the switch readout electronics, and packages the whole system in a compact way. Aerospace Applications North America builds, maintains and operates a mockup of the Orion cockpit located at NASA’s Cockpit Rapid Prototyping Laboratory (RPL) at the Johnson Space Center. The Orion cockpit mockup includes three display units, hand controllers and cursor sontrol devices for two operators, and seven swith panels set up in an “on your back” fashion to simulate ascent and reentry operations. All the controls in the mockup are functional and connected to a simulation of the Orion spacecraft display suite. A half shell, recovered form another project, provides a representation of being inside a capsule. Additionally, an out-the-window video taken during the NASA Exploration Flight Test 1 (EFT-1) is projected to a screen outside the mockup shell, giving users an idea of what the view would be like on the way to and from space. Audio files from the EFT-1 mission are synchronized with the video and played through a surround sound system, to further immerse the users. Finally, vibration units, driven by the audio, are mounted to the chairs to highlight major events, such as booster separation and splashdown. 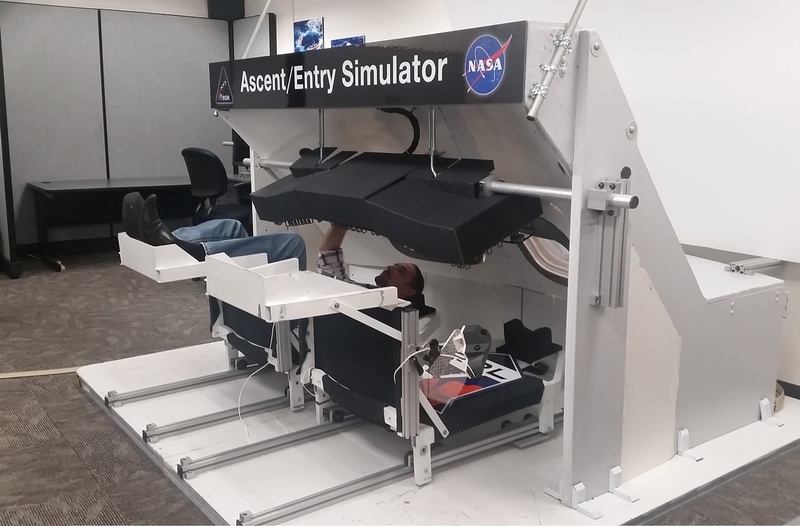 The mockup is being used to provide a realistic environment for astronauts to evaluate the Orion cockpit and to practice Orion spacecraft operations. A demo at the Orion cockpit mockup is also a popular item on VIP tours at the Johnson Space Center.